We, the undersigned organizations stand in support and solidarity with the thousands of Texans affected by Hurricane Harvey and the hazardous chemical releases that followed. While the full extent of the damage to these communities will not be known for weeks or months, one troubling trend is clear: the dense concentration of oil, gas, and petrochemicals facilities in the region has dramatically compounded the already severe impacts of climate change on Gulf communities. As Harvey’s floodwaters shut down power grids and plants across Houston and the surrounding counties, we witnessed one petrochemical facility after another exposing communities and first responders to harmful levels of toxic pollutants. In addition to damaging approximately 100,000 homes in the Houston area, Harvey caused the uncontrolled release of 4.6 million pounds of air pollution from refineries and chemical plants across 13 counties, including known carcinogens. Testing by the New York Times has confirmed the extensive presence of toxic chemicals in floodwaters across the region. In nearby Crosby, explosions at an Arkema chemical plant that makes feedstocks for plastics forced residents within 1.5 miles of the site to evacuate their homes. Neither the government nor plant officials provided residents with meaningful information about the explosions, the safety risks, or how long homes would need to be evacuated, even though the organic peroxides released by the explosions posed known contact and inhalation risks to those exposed. Misrepresentations of those risks caused multiple first responders to be exposed to hazardous chemicals without adequate safety measures. Like many other Houston communities, the people of Crosby have been left with the uncertainty of what was released in the air they breathe and the water they drink. Similar impacts were witnessed across the Gulf region. In Point Comfort, for example, the Formosa Plastics facility released 1.3 million pounds of excess pollutants, including benzene and other toxic gases. The intense concentration of petrochemicals plants in a low-lying, hurricane-prone region made these impacts a foreseeable, if regrettable, consequence of climate change. This is an urgent social and environmental justice issue that should have been planned for and must be addressed now. Communities that have suffered ongoing exposure to chemical hazards for decades are now bearing the brunt of both climate change impacts and increased toxic risks, problems largely attributable to the same handful of companies in the fossil fuel and petrochemical industries. 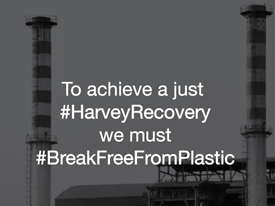 Even before Hurricane Harvey, massive expansions in the petrochemical and plastics facilities in the Gulf region threatened to exacerbate this situation and further increase the risks to frontline communities. In fact, a new analysis released September 20th by the Center for International Environmental Law documents industry plans to invest up to $164 billion in new plastics infrastructure by 2023, primarily directed to new plastics production in the Gulf region. The continued rapid expansion of plastics production and related natural gas production not only creates more toxic hazards, plastic-related pollution, and greenhouse gas emissions, but also ensures that continued climate change will make extreme weather events more likely and even more dangerous. Billions of dollars in aid are urgently needed to help affected families and communities recover, rebuild, and redevelop in Harvey’s aftermath. This creates an opportunity, an urgent need, and a solemn responsibility to ensure these funds remedy the systemic failures that led to this disaster and prevent similar disasters in the future. Recovery efforts cannot and must not become a mere excuse to accelerate fossil fuel and plastics infrastructure in the Gulf. Funds that are critically needed for families harmed by this crisis must not be directed to the companies that caused the crisis. These are not idle concerns. Following Hurricane Katrina, billions of dollars that were desperately needed to rebuild and revitalize communities were instead diverted to oil, gas, and petrochemicals companies. These companies received up to 65% of all Gulf Opportunity Zone bonds issued by the State of Louisiana in the six years following Katrina. The announcement that former Shell CEO Marvin Odum has been tasked to lead the recovery efforts raises serious risks that these mistakes will be repeated in the wake of Hurricane Harvey. Avoiding these mistakes demands an immediate commitment to a better path by leaders at all levels. Taxpayer money should not be used to bail out the same corporate actors that caused or contributed to many of these problems in the first place. It is imperative that efforts to recover and rebuild in the months and years ahead address the risks facing vulnerable frontline communities, rather than compound them, including the risks of pollution to their air, water, and soils, and the threat of catastrophic climate disruption. We call on local leaders in Texas and Louisiana and elected leaders at every level of government, to support immediate, inclusive, and community-led dialogue on the recovery and development of Houston and similarly affected cities and counties across the Gulf region, and to use those dialogues to deliver a better, more sustainable future for themselves and for people everywhere. In order for these dialogues to begin in earnest and begin to yield results, federal and state recovery dollars must be directed to affected families and communities, not to oil, gas, and petrochemical companies. This entry was posted in Blog, Featured and tagged berkeley climate action coalition, climate, climate change, fossil fuel, Hurricane Harvey, petrochemical, plastic-free by Ecology Center. Bookmark the permalink.